When I was younger, I never really recognized why I was able to connect to certain movies so well and others seemed like a different world. I wasn't aware, you see, of the many divisions even within what's considered a single culture in India. I knew we were Tamil, and yet, we were different from so many other Tamil families that we knew. And then we were from Bombay, which further separated us from the Madras Tamilians we knew (not to mention Sri Lankan Tamils, Malaysian Tamils, West Indian Tamils, etc.). But there were even further divisions that I didn't recognize till much later. Now I know that we are Palghat/Palakkad Iyer Brahmins, a sect of Tamilians that emigrated to Kerala, and picked up nuances of the language Malayalam. When my husband, who hails from a traditional Tamil family deep in the Thanjavur District of Tamil Nadu, told me his family was teasing him for marrying a Malayalee, I was surprised and insisted that I was Tamil, not Malayalee. He said, "But you're from Palakkad," and I said, "And?" ... with a deep sigh he said, "Palakkad is in Kerala!" --- I'm an idiot. I never realized that Palakkad was in Kerala, I had no idea! I thought it was perhaps right on the border with Kerala, and I knew our Tamil was mixed with Malayalam, but didn't know our ancestral village was actually IN Kerala. So Tamilians don't consider us entirely Tamil, and Malayalees don't consider us Keralite. I went and asked my mom after this conversation, "Mom, are we Tamil or are we Malayalee?" and she answered, "Yes." So I tried again, "Nooo, Mooooom, Are we Tamil or are we Malayalee?" and she thought for a moment, and told me, "We are Tamil Malayalees." Anyway, Tam-Brahms as we're sometimes called, aren't often portrayed in Cinema ... our dialect is too affected and difficult for many actors, and our culture has so many particular practices that I imagine many people cannot relate. There are some portrayals, such as Vikram's role of the Iyengar "Ambi" in the tamil movie Anniyan, or the mother-in-law played by Julie star Laxmi in the tamil movie Rhythm. Songs like "Iyengaaru Veetu Azhage" (Anniyan), "Madathile" (Veera), "Kalyanathaan Kattikittu" (Saamy), and "Ennathu Solvennungo" (Sivakasi) highlight the Brahmin background of the characters. Then of course, there's "I am Krishnan Iyer M.A." from Agneepath. 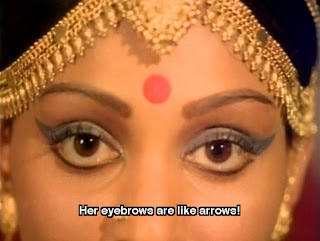 Oh, Mithun. Anyway, few movies delved into the everyday life of our community vs. displaying Brahmins as evil/greedy/ultra-conservative/stupid/weak or getting jollies off the idea of a Brahmin girl running away from her community for the love of a non-Brahmin man, like Trisha's character in Saamy (incidentally, Trisha is a Palghat/Palakkad Iyer like me, as are Vidya Balan and Priyamani). Two movies that come to mind immediately when I'm thinking of just normal, everyday, fun portrayals of Brahmin families are both Kamal Hassan movies. 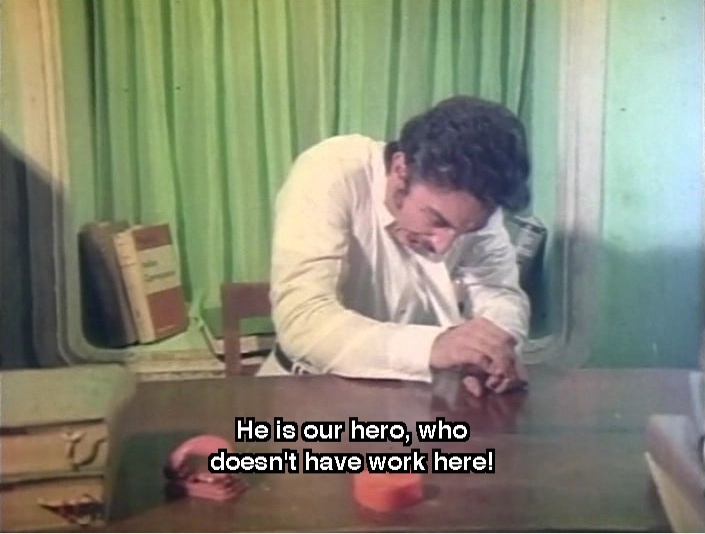 The first is the HILARIOUS Michael Madana Kamarajan, and the 2nd is Meendum Kokila (1982), in which the story doesn't revolve around their Brahmin background at all. The story could have taken place in any community. For this story, they just happen to be Brahmin, that's all. It's not to create caricatures or devise elaborate costumes for humor. Meendum Kokila is the story of Y.R.S. Mani, a young lawyer looking for the right opportunity for his career to take off. He is married to the beautiful, young Kokila (Sridevi), a Brahmin housewife that wears the traditional 9-yard sari called "madisaar" (I wore one for my wedding, and let me tell you, it's a doozy. I can't imagine wearing one every day like my great-grandmothers did!). Eventually through some connections, Mani meets a famous actress named Kamini (Deepa Unnimary) who hires him as her lawyer, giving him his first big case. Mani gets increasingly besotted with Kamini and begins lying to Kokila and spending all his time in the actress's company. Eventually his lies are exposed and the happy marriage is threatened. They show the couple in pretty normal domestic scene at home, Kokila bringing Mani some coffee. Very quickly, though, they expose Mani's greatest downfall ... his extreme fetish for the exposed skin of a woman's waist that shows when they wear the madisaar! When Mani sees this, he just can't contain himself. A special, themed mridangam and kinnaram (South Indian Carnatic drum and cymbals) music starts playing, his nostrils start flaring, and before he knows what's he's doing, he's reached out to grab & pinch! So the narrator takes us on a journey back to when they first met ... the special "bride-viewing" or Ponn Paarkkal as we call it. Having seen this movie as a child, I spent years planning and practicing various songs to sing at my own Ponn Paarkkal someday, really believing that this situation was going to happen for me. My husband and I ended up being a love marriage (gasp! SCANDAL!) so I never had a Ponn Paarkkal and no one ever wanted me to sing. If they had though, I would have been ready! So at Kokila's Ponn Paarkkal, they ask her to sing, and a veena is brought out, her brother pulls out his mridangam, and she sings the lovely "Chinnanjiru Vayathil" which is equal parts sweet and funny. Kamal Hassan provides the funny, Sridevi provides the sweet. As Kokila, Sridevi is wonderfully innocent and demure. Her eyes convey a million messages in this scene, especially at the part where she forgets the lyrics - her discomfort is evident without a single word! Finally Mani joins in the song to save her, and the slow, sweet smile that creeps onto her face is absolutely breathtaking. You can see how charmed she is by him, and he in turn gets to be her dashing knight, saving her from embarrassment. We come out of the flashback and learn more about their home life, which is a very normal, middle-class living. Mani is inexperienced in his career and waiting for his first big break, but refuses to take a post as a junior lawyer. Because of this they are being supported by Kokila's family. You can automatically see the tension between the couple from this arrangement. They also have a lovely little girl named Manju, who softens much of the tension (whether actual or sexual) between them with her timely quips, my favorite being when they are standing close to one another and Manju yells "M for Man! L for Lady! K for Kiss!". She's right to worry too. At the dinner, the men are being typical, passively sleazy men. 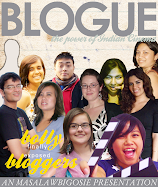 They ogle at a random ugly aunty simply because her sari falls down to expose her bosom. And poor Kokila, in her attempt to eat with a fork and knife, accidentally sends her food flying directly at the lady's bosom. Sridevi's expressions in this scene are adorably pathetic. The only actress who has come close to such a sincerely touching performance that I can think of is Kajol in Kuch Kuch Hota Hai, in the scene where she tries to wear a skirt and make-up to look like Tina. So Mani attends Actress Kamini's film shooting along with his colleague, who is working as her auditor. The scene is a royal Swayamvaram, where all the princes and kings of the land gather in a court and a Princess garlands the husband of her choice. There is lots of GRATUITOUS BODY SHOTS of Deepa Unnimary (one of my favorite Tamil item girls!) as Kamini before we finally see her in all her glory. When she has been fully exploited by the cameras, we finally meet Kamini! Kkamini from Salaam-E-Ishq ain't got nuthin' on you honey! The shoot is interrupted when Kamini throws her garland and it lands directly on Mani. They meet and Mani makes an impression with his wit and humor. From then on Mani spends increasingly long hours in Kamini's company, playing pool and talking. When a newspaper prints negative and false rumors about Kamini, she immediately hires Mani to take up a case against them. This is cause for great celebration for Mani and Kokila, but little do they know that it's the beginning of all their troubles. The scenes where Mani is doing his first appearance in court are sweet and funny. 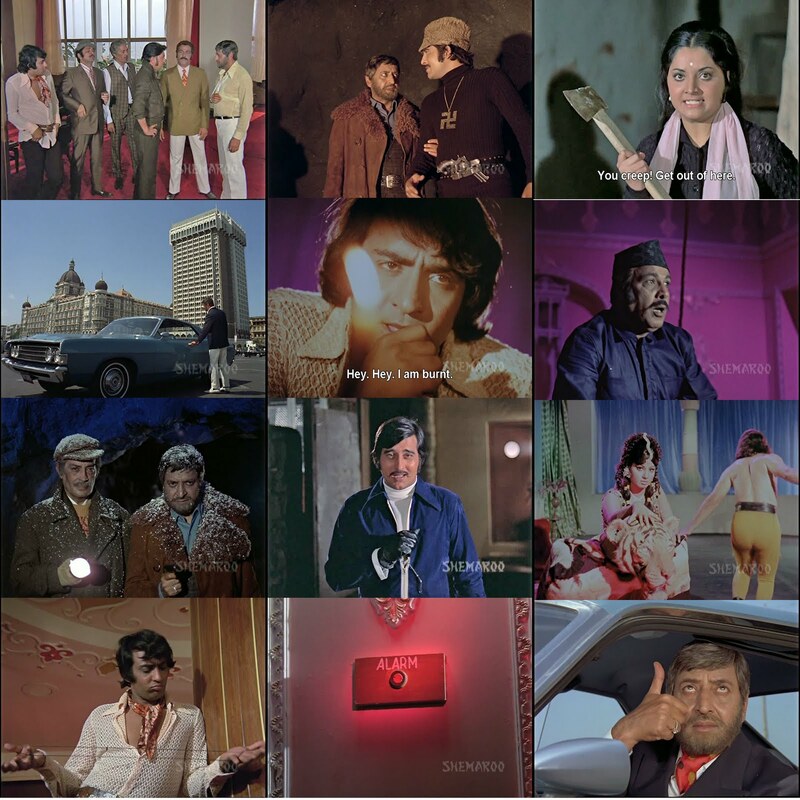 Unlike most Indian films where the hero is perfect at everything, Mani is nervous and bumbling in court, dropping papers and addressing the defendant as "Your Honor" instead of the judge. But as he goes on, he gets his bearings and begins to gain confidence. This movie is both endearing and disturbing. I'm definitely not a person that takes cheating lightly, even in fiction. I didn't enjoy movies like Sindhu Bhairavi, Chinna Veedu, or even KJ's Kabhi Alvida Na Kehna, no matter how much the filmmakers try to make you sympathize with the cheating husband (or wife, in KANK's case). It's strange because in Meendum Kokila, there isn't technically cheating going on ... they are just very good friends. There are moments where he still shows great love and affection for Kokila, and even tries to romance her, most notably after he attends another one of Kamini's shootings. Kamini is performing in a rain scene, and the pretty, albeit slightly raunchy "Ponnanameni" inspires him to go home and try to re-create the scene with his wife. This is a MUST-SEE scene, particularly starting at 2:22 when he goes home. So funny and sad all at once. But then there are clear signs that Mani is besotted with Kamini. In one scene he's trying to cuddle with Kokila at night, and she is irritated with his efforts and pushes him away. He rolls over and immediately starts imagining Kamini lying next to him, and fantasizes about cuddling with her. Another great Sridevi scene is when Kamini has to play the role of a Brahmin woman in madisaar, and none of the costumers on set know how to tie the madisaar for her. Mani immediately goes to bring Kokila to help tie the sari for Kamini. Her expressions of distaste and discomfort when she learns that a man usually dresses Kamini are amazing! Subtle, but they convey so much! Then once the sari is tied, we hit trouble. Remember Mani's fetish? Oh yes. He reaches out and grabs. Right in front of his WIFE. 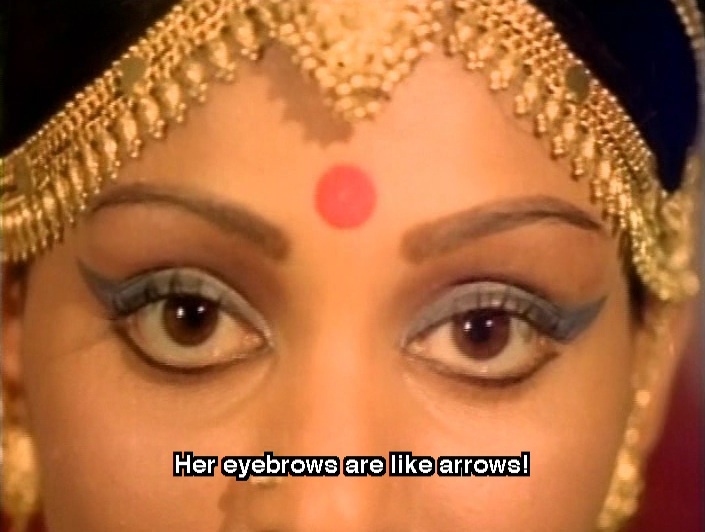 Needless to say, Kokila is FURIOUS. He manages to convince her that he did it because he was imagining HER in the sari, not Kamini. It takes a while, but she eventually forgives him after he emotionally blackmails her and pretends he is going to kill himself if she doesn't believe him. V. annoying, but in the very next scene there is a wonderfully funny dream sequence with the song "Radha Radha Nee Enge". Still his emotional affair with Kamini continues. She invites him along for a film shoot in Bangalore, and he lies and tells Kokila that he's going for a friend's wedding in Bombay. In a very cute parting scene, she packs and gives him three huge boxes of homemade snacks to give to all their relatives in Bombay. In Bangalore he and Kamini become even closer. These scenes were definitely disturbing to me, because even if he wasn't physically involved with Kamini, the intimacy between them grows very strong. For him it's particularly unforgivable, he's lied to his wife and is traveling and sightseeing with another woman, as shown in the song "Hey Oraayiram" (in which Deepa is dressed in the MOST unfortunate outfit for her body type. I should know, it's pretty close to mine. That darned Mallu booty!). And even if they aren't romantically involved but he's fantasizing about it and spending so much time with her, isn't it still cheating in a way? Even for Kamini, who is mostly portrayed as a nice person in the movie, at some point don't you have to question why a married man is spending so much time with you. Mani lies to her when she asks about Kokila, and tells her that Kokila is thrilled that he's spending time with Kamini. But honestly, you KNOW when you're overstepping boundaries, and I saw Kamini as a lonely character who allowed herself to be swept along with the flow of their friendship and didn't question it too much because she had too much to lose. While gallavanting about Bangalore, they end up running into some excessively rowdy fans of Kamini's that end up attacking her. Mani is forced to call upon his ancient martial arts lessons, and his memories of Bruce Lee movies, to fight off the goons. This is a particularly memorable fight scene because the hero isn't naturally a fighter, able to fight off multiple rowdies single-handedly. He falters often, which makes for wonderful comedy. He ends up with a broken nose, but is able to save Kamini. Naturally this kind of celeb news will not escape the papers. The news comes back to Kokila in Madras that her husband was involved in a scuffle with goons defending Kamini in Bangalore. Together with her brother, they confront Mani with the news article when he returns, still claiming that he was in Bombay. He covers up the story, claiming that he went to Bangalore for one day only to work on Kamini's case, but still Kokila is angry. She tasks her brother with following Mani about town, and of course, finds out just how often he is visiting Kamini's house, and grows more and more stressed, angry and sad, driven half-mad by her suspicions. Eventually Kokila is driven to go directly to Kamini and (in a heartwrenching scene) beg for her husband back. Kamini seems genuinely shocked and upset by Kokila's request. In a confrontation with Mani, she claims that she had grown close with him thinking that she had finally met someone intelligent, with whom she could truly have an innocent friendship, but she is disappointed and hurt to know that he was besotted with her just like so many others in her life. With a heavy heart, she tells Mani she doesn't want to be the cause of a family breaking apart and throws him off her set and out of her life. Mani is dejected and begins wandering the streets aimlessly. Meanwhile Kokila is dealing with something far more serious. Baby Manju has developed a high fever, and Mani is nowhere to be found. Will it take something life-threatening for their child for Mani and Kokila to work out their issues? And what role will Kamini play in Manju's illness? Therein lies the climax of the film, which ties a neat bow but still leaves me unsatisfied. I found myself troubled by Mani's obvious fixation with Kamini and his lies to his wife, while at the same time it seemed to me that he was still genuinely in love with his wife. Then again, perhaps this is the more life-like tale, showing how people CAN be in love with their spouse and still have a crush. So then is it ok, is it just human nature? Is it forgiveable as long as one doesn't act on it? Can a man and a woman just have a platonic relationship? And if Kamini REALLY saw their friendship as completely innocent, why didn't she ever ask Mani to bring Kokila along to spend time with them too? Did her loneliness influence her to ignore the warning signals in her own head and move freely with Mani despite the fact that he was indeed a married man? Personally I've battled with these questions a lot - watching how one by one I seemed to lose all my male friends after getting married, or trying to preserve friendships when underlying feelings made it virtually impossible. I'm of the opinion that you can't really go past a certain level of friendship if you want to remain respectful of your spouse. I would probably be far more upset if my husband had a close, intimate friendship with another woman than if he had a physical tryst. And when I meet the girlfriends or wives of close male friends, I KNOW that I must go out of my way to befriend them and make them comfortable with the fact that I am no threat to their relationship with their boyfriend/husband. If Kamini truly wanted to maintain an innocent friendship with Mani, shouldn't she have befriended Kokila too? What on earth could have made her think that it was appropriate for him to leave his wife and child at home and travel to all her location shoots with her? A problematic film in that it doesn't answer these questions or really give any consequences to Mani's actions, but it certainly pieces the elements together in a way that one can really enjoy. Kamal Hassan embodies the role of Mani with mastery, showing weakness and folly, his intentions and his actions, all convoluted so much that even he himself probably doesn't know what he wants. Deepa too brings a sympathetic angle to Kamini, and you want so much to like her, particularly in the final scenes when she tries to do the right thing. 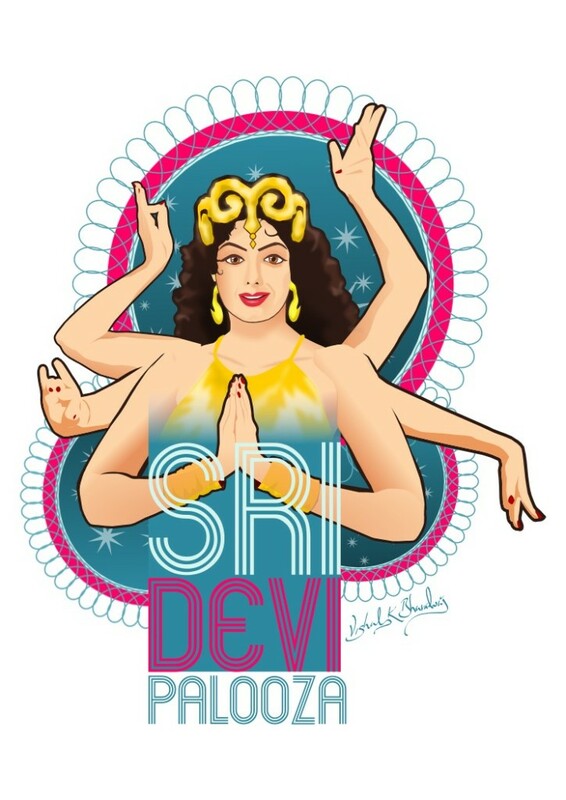 But the reigning queen of this show is definitely Sridevi as Kokila. Her range of expressions, her descent into jealousy and rage, and her transformation from innocent and trusting to the emotionally ravaged person she is at the end are tremendous. It is no wonder she received the Filmfare Best Actress Award (Tamil) for this film. She is a revelation in it, and you cannot help but love Kokila and cheer her on and want to clock Mani for hurting her so much. Worth seeing for the lovely songs, the subtle comedy scenes and for Sridevi's incredible performance as Kokila. It also forces you to ask yourself a lot of serious questions! No matter how disturbed I am by Mani's behaviour in this movie, it still remains in my favorite movies list for the lighthearted moments in the first half of the film! Pearl S Buck wrote,'Doubt is the dust that Satan cast to blind the eyes of (wo)men'. Many cases I used to feel that the women in our lives generally 'think' that their man is not honest or not straight. 'Man's honesty falters when he is with a girl'. Really? While on one side, platonic affection is possible. On the other side, I have generally found girls get a sixth sense or a warning you might say when they see their man with another woman who might be a threat. They get a warning without any word said; without any action being made. They know it! and on most occasions, they are right! "Anyway, Tam-Brahms as we're sometimes called, aren't often portrayed in Cinema "
You are mistaken. 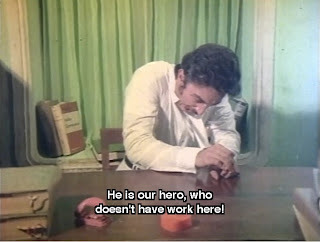 Brahmins are vastly over-represented in Tamil cinema, probably because Brahmins are over-represented among filmmakers (and perhaps early urban audiences). So glad to read someone still feels the same as i do about cheating in this new age, where relationships are for most people just "move on" if it doesnt work attitude.A lot of people might think emotional cheating isnt really cheating coz if they are not physically intimate with the other person....but still fantasizing about another and being infautated with another is being unfair to our partners...one might argue that you cant help it, people get attracted to each other for different reasons......but still when one is truly commited to a lifelong relationship such as marriage, their reasoning and awareness of right and wrong cant go wrong....its only when one gets selfish and wants to satisfy thier own emotional needs and goes in search of it outside of thier marriage instead of approacinh thier partners to sort thier insecurities; being totally insensitive to how thier partners would feel about it that really messes things up........Emotional cheating is a lot of times hard to tell coz no one really admits to it and just pretend like their partners are thier everything in life....which is think is soo hypocritical and dishonest......its so apalling to know that all this happens all so often around us....i wonder how weak willed, conscienceless those people are that give in to fantasies putting thier partners through heartache and wreakin thier partners lives with this for thier own selfish needs and happiness.....all after the long wedding vows which in the end mean nothing? Loved the review. Have watched this movie as a child over 23 times. Still my favourite.